Over-Night Ski- and Snowboardservice. Free ski storage on the piste. 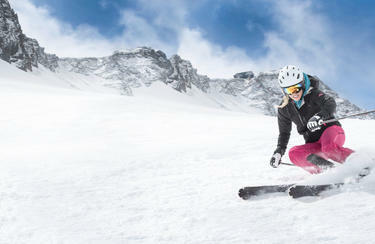 Snowboarding, carving, freestyling - draw from rich winter sports opportunities that are offered in Saas-Fee. INTERSPORT Derby Sport in the center of Saas-Fee always has brand new models at hand that can be tested extensively. You can also easily switch to other sports equipment, without additional costs. Just as you recover from a busy day of skiing, your skis do in equal measure. The overnight service brings your board back into shape. The winter sports experts at the INTERSPORT Sport Derby in Saas-Fee add a sufficient surface and sharp edges to your equipment with the necessary care in order to guarantee pure skiing pleasure. Of course the experienced team will advise you which treatment is best for your ski. Get useful information for your holiday in Saas Fee to your mobile! The two men in the ski deposit shop next to Larynx Bar were amazing every day (think Pascal and Sylvio) they really made our holiday as it was so easy picking up from them and they were good fun. Whole service from start to end was excellent. Toller Depotservice, so dass man die Skiausrüstung jeweils über Nacht vor Ort deponieren kann! excellent and friendly services! A good start for the holiday's!